I received an SMS today. That’s it, over there on the right. Yep, seems that my number came up in the KIA Motors Promo draw. Wow! £550,000 pounds That’s about SG $1,045,000. Wow again. I could buy a small condominium here AND a car. I’m sure I could get a condo for about SG $800,000 somewhere … maybe Woodlands ((are there any condos in Woodlands?)). The sum is about AU $810,000 – not to be sneezed at I guess. The only problem is that it is a scam. Yep. My number could not have come up as it never went in. Also, the notification of the winnings in UK pounds (I’m guessing they are UK Pounds) is being sent to my Singapore phone number. Come on guys, if you are going to scam me, at least put in some effort! Other issues? Well, for a start the SMS came from a Nigerian phone number (+234 is the Nigerian country code). 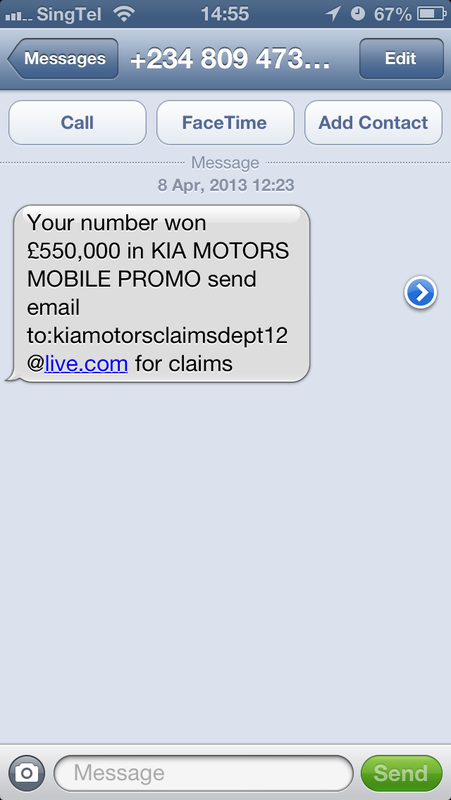 Also, I can’t see the KIA Motors Claims Department using a Microsoft Live email address. Really, poor effort. I’d score this one about 3/10. Better luck scamming next time! Seriously, this is a new scam doing the circuit. Beware.